Remember that first time the mainstream media really focused on the $VIX during the credit crisis? It seemed as though a holy grail was unlocked, but all it really did was give investors another path to bad analysis. I've seen just about every indicator thrown up on the VIX, but because the market technician doesn't understand how supply and demand works in the options market, it becomes an unreliable pattern, and is more about fufilling a bias on the market. That's why this past quarter I teamed up with FTPress to bring clarity towards properly reading volatility measurements. The final result is Timing Volatility. A Volatility Primer. To understand the VIX and other volatility readings, you must first understand how the options market operates. The supply and demand mechanic for options is completely different than that for stocks, bonds, commodities, futures, and forex. Developing Models. Once you understand how the market operates, you can take ideas you have about the market and turn them into actionable timing signals. An example model is provided in detail. Trading the Models. You can't get long the VIX. It's a statistic. Trading volatility readings can be done a multitude of ways, through option strategies, futures, and equity trades. We detail the possibilities available. The Best Timing Tools. Technical analysis on volatility readings works-- if you use the right tools. This goes into simple trend following indicators and delves further into more advanced market mechanics such as volatility skew and term structure. Timing Volatility is a wonderful starting point if you are looking to incorporate options-based timing signals into your trading. This ebook will provide you with the jumping off point to develop more accurate timing models. 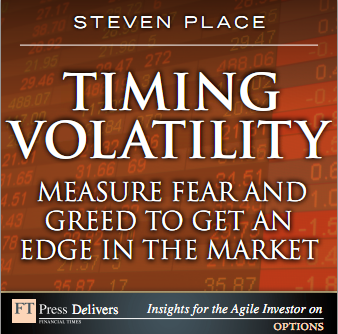 Timing Volatility is available at fine e-retailers everwhere, including Amazon.